The Future has been predicted by IREO Skyon and it's fantastic, Coming Soon from "IREO Skyon" Homes in Sec -60 Gurgaon, loaded with insightful, hi-tech homes control solution,with 2/3/4 BHK BR options overlooking a Golf Park. Close to the metro line extension with quick and easy connectivity to Delhi airport and NCR, IREO City Skyon promises to offer the best blend of uniqueness and premium location without compromising on value. 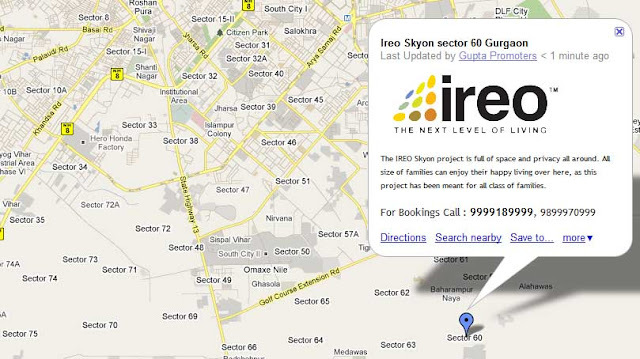 IREO Skyon Gurgaon project is spread over almost 18 acres and will be exquisitely landscaped overlooking a Golf Park. THE FUTURE HAS BEEN PREDICTED AND ITS FANTASTIC !!! 2, 3, 4 BHK Apartments loaded with insightful, Hi-tech home control Solutions, Overlooking a Golf Park, In Sec-60, Gurgaon. Some Standard Features of IREO Developments. · 3-4 Side Open Apartments. · State of Art Recreational facilities, Club House. To register your interest for the same.